What is fitness? How does one achieve it? How is it measured? The first question appears to be the simplest but is in fact the hardest to answer. In comparison, the other two are straightforward. The problem with defining fitness is that the condition varies with individuals. Lack of fitness is more easily described and is more obvious. Shortness of breath when exerting oneself, being overweight, slowness, clumsiness of movement and lack of agility are some of the symptoms. It is important to understand that the concepts of fitness involve several factors of which muscular strength is only one, power (a combination of strength and speed), stamina, endurance and flexibility are others, which include factors of agility, coordination and skill. 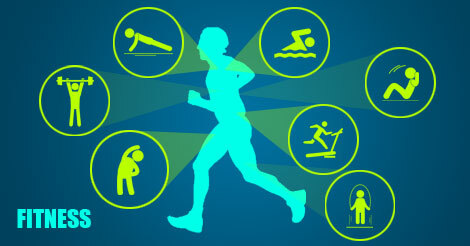 All of these cannot be found in a single conventional training for fitness. Acquiring fitness is easier and more rapid for the younger person than for the older person, especially when the latter has been inactive for a longer time. Thus fitness is specific to the individual and can be related to a person’s goal in life, whether taking on comfortable, everyday tasks (hazards) or wishing to be super fit for a chosen sport. To be fit means possessing all the components mentioned above in some measure. Fitness is indicated generally by the pulse, heart beat, capacity to do exercise and good blood pressure reading.